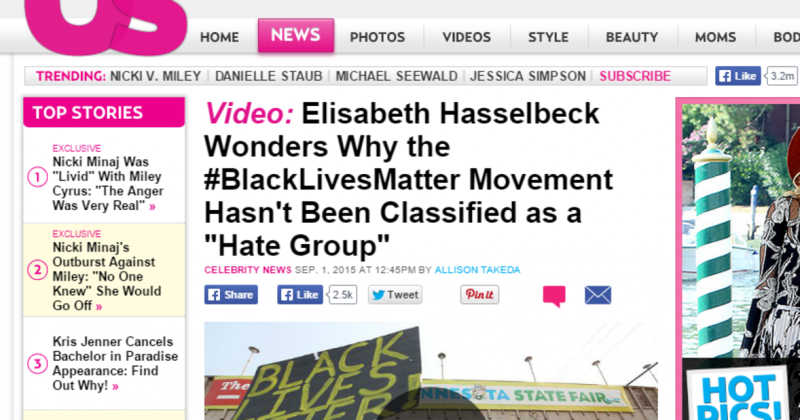 So I rode the coattails of Elisabeth Hasselbeck, but it was my idea. I sent my talking points to Fox & Friends, and was interviewed about the bogus #BlackLivesMatter farce. Many times, the hosts will use the talking points as setup questions, since they may be curious as to why you said it. That’s what Elizabeth did, and the fallout has been amazing. As they saying goes, “All news is good news,” so Elizabeth and I are making the rounds. It’s nice that the lamestream media continues their attack on black people with this nonsense #BLM movement. This movement endangers black people, actually putting them in harm’s way. If “Us” magazine decides they want to interview me, I have a few questions for them. My next question is, “Why hasn’t Obama met with the #BLM movement to discuss all the cop killings? Isn’t it HIS DOJ, or did he just INHERIT IT FROM BUSH?” Instead they target a couple of worn out old white people like Bernie and Hillary, when they should be picketing the man in charge. Here’s another question. “How many times has this movement CONGRATULATED THE POLICE when they take the many murderers off the street, or #SaveBlackLives?” I’d love to see the #BLM people march through Compton or 8-mile with NO police protection at 10P, like they did in Ferguson. I have been monitoring many of their marches and activities, and there are MANY black people there. There hasn’t been a SINGLE incident of cop violence with such a target-rich environment. Yet, these morons ask for police protection for their nonsense marches. Another item that might be of interest to the #BLM crowd and Us magazing is when black people are killed, I’ve never seen the police go on social media to celebrate. In fact, most go to counseling. Many can’t sleep. This group trivializes one of the most difficult jobs in the world! This idiotic “movement” is an attempt to dehumanize the police, in effect sanctioning whatever happens to them. This group should be declared a hate group. And Obama is just as complicit, since he will not stand up for justice, instead enjoying his thugocracy. These people are the true definitions of #sellouts!